Stock photo of the Fantail Falls in Mt Aspiring National Park, Haast Highway near Haast Pass, West Coast, South Island, New Zealand. 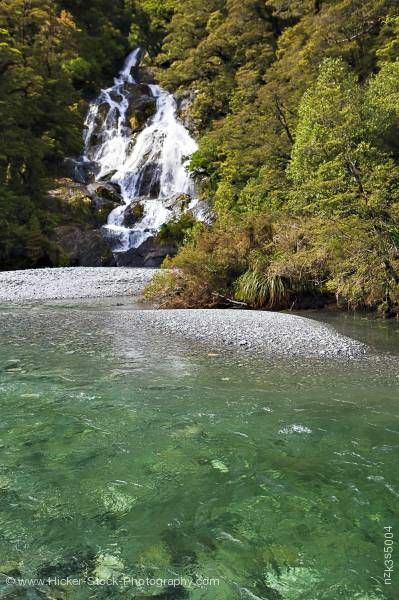 The alluring Fantail Falls cascades down a rocky ledge in the Mt Aspiring National Park. This stock photo shows the alluring Fantail Falls in Mt. Aspiring National Park, Haast Highway near Haast Pass, West Coast, South Island, New Zealand. From the crystal clear waters is a view of the Fantail Falls. The foamy, misty, white waters flow heavily into the rocky shoreline below. These beautiful falls cascade down the hillside separating in to different sections of the rocky ledge causing it to “fantail”. Sun bleached rocks of the sandbars lead to crystal clear waters of the river reflect a light green from the sunshine. Lush green trees surround rocky ledge of the Fantail Falls showing a touch of autumn colors in their foliage. Highlights of red and gold can be seen throughout the green. Fantail Falls in Mt Aspiring National Park, Haast Highway near Haast Pass, West Coast, South Island, New Zealand.